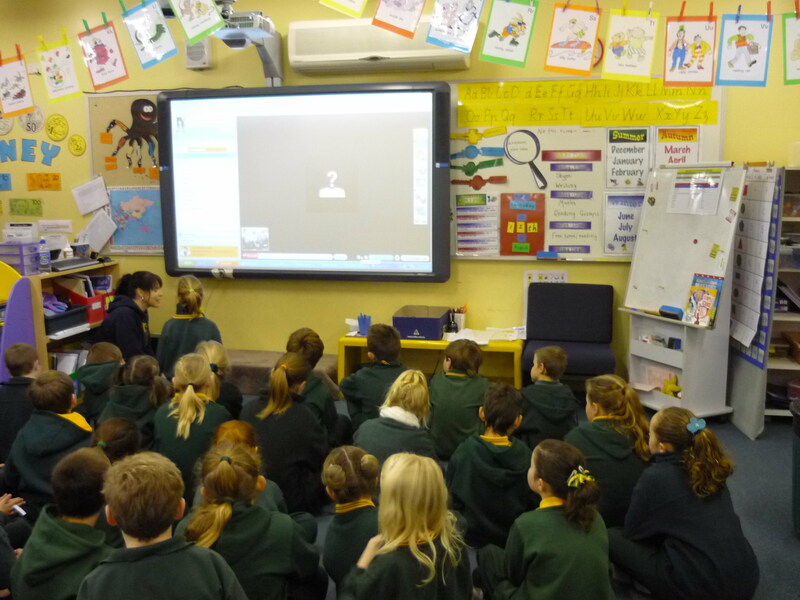 Last week I was contacted by Jewel Topfield, a reporter from The Age newspaper, who wanted to visit my classroom to watch me teach and talk to me about how I use technology in the classroom. Jewel and a photographer visited one of our daily reading rotations in my grade two class and had the opportunity to see how we were using our interactive whiteboard (IWB), blogs, iPod Touches, Google Docs, VoiceThread etc. This article appeared in The Age and the national Fairfax newspapers on Saturday 21st August. The article is entitled “Digital Natives Restless”. While I wasn’t aware that this was going to be the theme of the article, I thought the article painted a positive picture of how technology can in integrated in the classroom. I know my class will enjoy their five minutes of fame! There were also some really important issues raised in the article about the need for digital classrooms to become to norm and the issues that surround this. I did however try to make it clear when being interviewed that the digital native/immigrant debate is really not black and white. While students may have less reservations about “having a go” when it comes to technology you cannot assume that students are born with (or intuitively “pick up”) the skills they need. At the beginning of the year, I wrote a post about teaching technology “post noughties” and alluded to the importance of being explicit when teaching technology. Click here to read it. While the newspaper article suggested that each of my students are a “digital native, someone who has never lived in a world without MP3s, mobile phones and a global information network at her fingertips.” We cannot assume that just because children are growing up with these technologies that they use them or use them well, creatively and safely. The role of the teacher in guiding technology use is more important now than ever. Teachers who cannot or will not take on this role are doing their students a disservice. While, I still believe this is an important point to make, I was thinking aloud when trying to remember who said that in my interview and shouldn’t have mentioned the name Sir Ken Robinson as I’m pretty sure it wasn’t him. I think it was Stephen Heppell but if anyone can confirm that I’d be grateful! Apologies to Sir Ken and Prof Heppell! Are “digital natives” restless? What do you think? I completely agree with you Kathleen. Most (but certainly not all) of our students are confident to have a go with technology but they are not highly skilled in the use or the social and ethical impacts of ICT. If we don’t use modern technologies in our classrooms they will become increasingly disconnected from and irrelevant to our students’ worlds, but it is imperative that we explicitly teach the skills, cybersafety and ethics as well. Here’s a related issue: how do we develop parent skills in these areas as well? You’re right – this sort of stuff is really imperative. Great question, how do you develop parent skills?? I find my class blog a great talking point for families so posting about the cybersafety/ethics issues etc we’ve explored in class is a good start. I also send a fortnightly e-newsletter to all parents. This could be an avenue to share tips and info. I’d love to hear any more ideas people might have! Kathleen, not only are the digital natives restless, I believe the entire educational community is restless. Digital classrooms are essential for our students to receive the quality education necessary for them to be productive citizen when they become adults. There appears to be a ground swell movement going on with this issue. While governments and individual states are moving toward digital classrooms, the most effective advancements are coming from individual classroom teachers like yourself and your teaching buddy, Kelly Jordan. Other issues, I feel are equally important for our students to be productive citizens as adult are global awareness and civic/humanitarian responsibility for one another. From following your blogs and classroom activities the last few month, I have the feeling you would agree. A couple of activities/programs that have touched our elementary/primary students are Pennies for Peace and Read to Feed. Pennies for Peace is a program started by Greg Mortenson author of Three Cups of Tea. http://www.penniesforpeace.org/ . Read to Feed is sponsored by Heifer International, a long established global humanitarian effort. http://bit.ly/aSNB3t Just sharing these two ideas with you and Kelly and offering the highest of praise to you two. As teachers, you are not only touching the lives of children but also modeling for educators throughout the world. Wishing you all the best as you finish out term III. @ Rich, thank you so much for your kind words! I agree with you 100% about the importance of a global and social awareness. I have been looking for ways to work on humanitarian issues with my class so your comment was timely. I will check out Pennies for Peace and Read to Feed. They sound like terrific programs. I think you’re right that the change to digital classrooms is going to be a slow one and focussing on early adopters is important. I also hope that I can inspire some teachers along the way to embrace a more digital classroom too! I think common sense (not always abundant) should prevail. I have seen teachers/lectures from the baby-boomer generation use technology more efficiently and intelligently than some “digital natives”. It’s never been about the technology, but what you do with it and how you enhance and improve teaching and learning. Bootm line, being social media savvy does not mean being e-learning, informal learning network, online learning or whatever-you-want-to-call-it-savvy; it is a good skill, but no more. Hi Max, thanks for the comment. There is a lot of discussion on this topic isn’t there. I look forward to checking out the report! It is so nice to see technology in education shed in a positive light. So often stories involving kids and technology focus on the dangers of technology or the damage that tech is doing to our kids. Really enjoyed seeing the article! I’m sure the kids were loving their minutes of fame! Great post Kathleen! It was great to see a positive spin on technology in education. We recently had our town mayor as Principal for a day. When visiting my Grade 1 classroom she was ‘gob smacked’ by the way the 6 and 7yr olds were using technology…sending out tweets about the book we had been reading, writing draft blog posts and reading online books. She spoke of her own daughter who has children about to enter the education system and the ‘reluctance’ on her daughter’s behalf about technology in education. It was wonderful to hear her comments that adults (and here I’m going to use the term ‘digital immigrants’) would benefit greatly by visiting schools to see for themselves how technology can engage and support learners today. As for the ‘digital natives are restless’ headline, I agree that we cannot make assumptions that the kids today ‘just know’ about technology…I find a real mix of experiences and prior knowledge in my classroom when it comes to what these kids bring with them to school. I would agree that these kids are not scared of technology – they don’t think they will ‘break it’ (which is something I had to learn) and are willing to explore and see what they can learn. I too, hope to encourage and support other teachers to embrace technology in their teaching and learning and congratulate you and your class on being such positive examples of great learning. Keep up the great work and thanks. @ Trish, thanks for your comments. It is always great when people visit your classroom isn’t it? What a good idea having your mayor as the principal for the day! I’m interested to hear that you use Twitter with your Grade Ones. It’s something I’ve thought about but haven’t ventured into yet. I’m just checking out your blog – it’s terrific! A few weeks ago one of my students, Maddie, moved to Ballarat and is going to your school! Small world. Keep up your great work!! @ Brian, thanks so much for your supportive comment! I’ve done a couple of guest lectures at our local uni and I’ve found the student teachers are really keen to learn about technology integration – they seem to realise the importance! Thank you for sharing my work!